An informational Web page on the condition foot neuropathy has been published, detailing the symptoms to be aware of and the role of shoe insoles in treatment of symptoms. The company's Sorbothane-based insoles are category leaders in shoe inserts and insoles. Often the next step is to begin a trial-and-error process to find the best shoe insoles for a person's foot neuropathy. Our new informational page links our shoe insoles to possible resolution. RxSorbo, a leading online retailer of top-rated shoe insoles, is pleased to announce the publication of an informational Web page detailing the medical condition foot, or peripheral, neuropathy. The symptoms to be alert for are described, and the role of shoe insoles in alleviating the discomfort of the condition are discussed. “Podiatrists and other specialists may diagnosis a person with foot neuropathy (also called or peripheral neuropathy), a condition that creates noticeable weakness, pain and numbness in the feet,” explained Rj Yozwiak, Manager of RxSorbo. “Often the next step is to begin a trial-and-error process to find the best shoe insoles for a person's foot neuropathy. Our new informational page links our shoe insoles to possible resolution." To visit the informational page on shoe insoles and neuropathy, visit http://www.rxsorbo.com/rx-blog/foot-ailments-foot-neuropathy. There one can learn some basic facts, plus go up to the company's online sole to begin the process of selecting shoe insoles for one's condition. No matter the reason, neuropathy of the feet is painful and comfort may be offered by using a good orthotic walking shoe insoles. After a qualified physician has given a professional diagnosis, they may suggest a walking shoe insole to help treat neuropathic pain. With an impressive, and easy-to-use online store, RxSorbo now combines that feature with informational posts on common foot maladies and ailments. 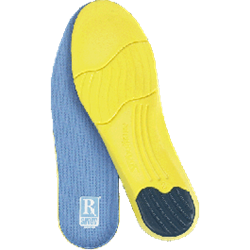 To browse available insoles for all conditions and uses, one can visit the following URL: http://www.rxsorbo.com/. There, one can browse the company’s classic heel pads, classic insoles, and the all whole line of walking shoe insoles. The company's insoles are based on Sorbothane, a one-of-a-kind visco elastic polymer. 100% unique - Sorbothane® is a solid that naturally ”flows” like a liquid - Sorbothane® absorbs impact shock and provides comfort better than any other insole material available today.